Welcome to my very first blog. I intend to share information that is health related and in particular Chiropractic related. I will also let you know what is going at the office in terms of closures for the holidays and when I will be away for personal holidays. If you have any questions or topics you would like me to address on this blog please let me know through our website email at DrDavidEgan.com or using the comments section below. It’s December 12, Christmas is right around the corner and we have had our first snowfall already (YEAH!). We at Scott Road Chiropractic wish everyone a Merry Christmas and a happy holiday season. Speaking of snow, be careful driving on the roads. Slow down a little and give yourself lots of space between you and the cars ahead of you. If you do have an accident get yourself checked out right away. The BC Chiropractic Association and ICBC have a pilot program where you can go to the Chiropractor for motor vehicle accident injuries and all the costs are covered by ICBC. You don’t have to pay anything and there is no set limit on the number of treatments. I will be taking some time off around Christmas this year. On Dec. 24 I will work from 9-12 noon and the office is closed Dec. 25th and 26th. I will work Friday Dec 27th from 9 am to 6 pm as usual. I will be gone the next week from Dec 30th to Jan 3rd. I will return to work on Jan. 6th. We are going to Las Vegas and surrounding areas for a family get away. It’s not that often any more that both of our sons come with us on our holidays so I am looking forward to it. Oh, I almost forgot, thank you to all who voted for me in the recent Reader’s Choice Awards in the Surrey – North Delta leader. 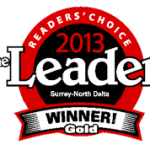 I was voted the #1 Chiropractor for Surrey and North Delta. I feel very honored and humbled by this. Merry Christmas and have a happy, healthy holidays.